In Somnyama Ngonyama, the isiZulu for “Hail the Dark Lioness,” South African artist Zanele Muholi presents a black and white series of self-portraits. I say “presents” as though Muholi made them for us and is awaiting our reaction—as so many artists do—yet, in this case, I say it with a dash of irony. Muholi may be offering these images to the public, as works of art for our contemplation and for sale, but that seems rather incidental. 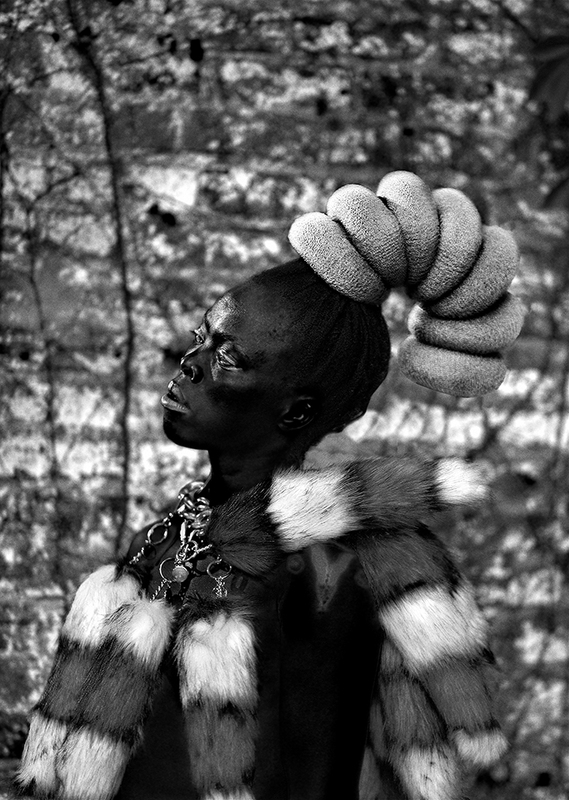 The overwhelming feeling behind these images is both demanding and neutral: Look if you want, but Muholi doesn’t need you. The series has already been exhibited widely around the world, but was published as a book of collected self-portraits and essays in late 2018 by Aperture. 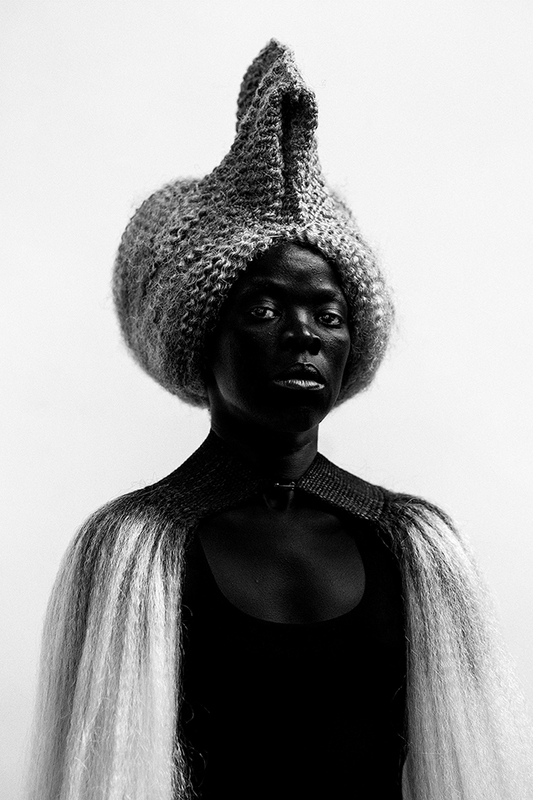 The communications team helpfully informs me, together with the press kit, that “Zanele Muholi now prefers to be called ‘Muholi’ or the gender neutral pronoun them/they.” It is unsurprising, given the tone of the body of work, that Muholi would also try to take command of how others speak of them. “Them”—the grammarist in me struggles to speak of a single person in the plural, but language is fluid and lacking a better word in its place, I respect their wishes with my words. The language becomes clunky and unnatural—do I say “they takes pictures” or “they take pictures”?—and yet the fact that I find myself adjusting around Muholi is somehow part of the program. They is not to be owned by me, or fitted neatly into my worldview. I cannot hide the fact that I love this work, Somnyama Ngonyama. Muholi creates an identity, performs an identity, dismantles an identity, confronts with identity. 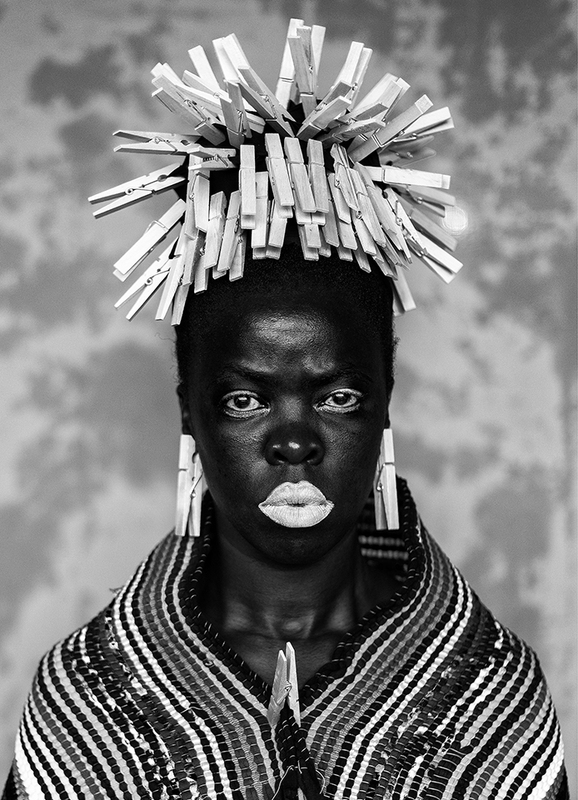 The self-portraits seem both real and fantastical: The sitter plays with colonialist constructed identities of “native” peoples who decorate themselves with paints and costumes, yet all too quickly we realize the flourishes Muholi uses are common household instruments like scour pads, clothespins, and chopsticks. They is toying with us, mocking us, challenging us. And yet that’s not the point at all, because through Muholi’s eyes I see they is being truly themself, they is claiming ownership of themself. Muholi’s gaze is part of what makes me so uncomfortable: it doesn’t ask anything, it asserts. While it seems at moments on the verge of violence, this is a projection that reflects the viewer’s expectation of acquiescence. We expect “her” to yield under the power of our gaze. We expect her modesty, her conformity. We want her to be prepossessing. The word feels particularly apropos, prepossession—it’s used to mean attractive, but literally describes a person who you possess with a favorable feeling in advance of knowing who they are. That is, something is favorable to us because we feel ownership over it. Unprepossessing means—apparently—that something is unattractive, and that tells you a lot about people. Muholi is unprepossessing, and by that I mean I don’t own them. By that I mean, they’re so beautiful I hope I never do. 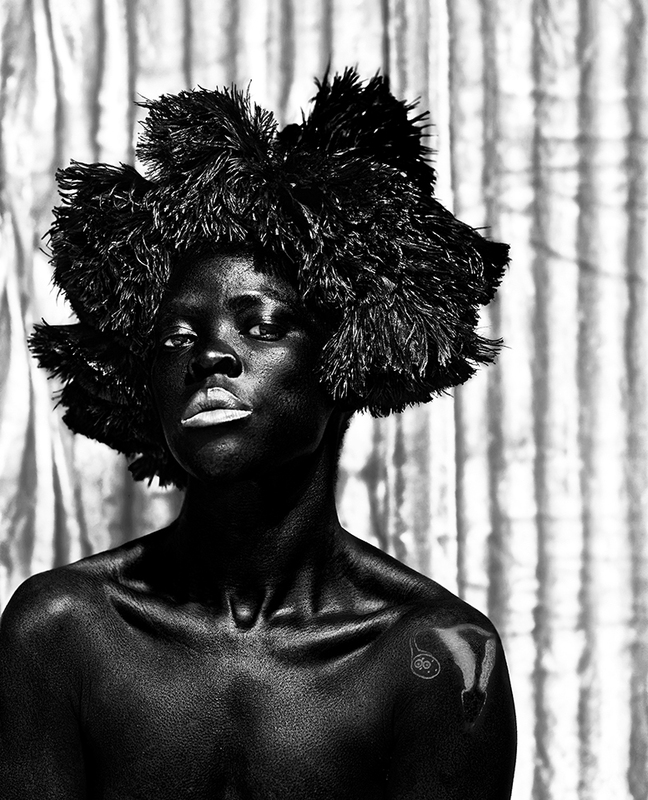 In Muholi’s images, there’s a vulnerability in the self-exposure that feels like raw strength. In the book, each time I encounter an essay, I find myself somehow offended by the intrusion: these people are trying to speak for Muholi?! As I write these words, commentary feels so banal, so weak, so flaccid. Muholi can speak for themself. Somnyama Ngonyama, Hail the Dark Lioness is available from publisher Aperture.